A consistent favorite among Vacheron Constantin fans, the Malte watch line’s Tourbillon Regulator has recently been chosen as the best tourbillon watch of the year by the 2008 Premier Middle East Watches, Jewelery, & Pen Awards held at the Ritz Carlton in Bahrain last month. Judges were comprised of industry members as well as the general public. This Malte watch combines a tourbillon and regulator complication using an in-house Vacheron Constantin tonneau-shaped caliber 1790R movement. A power reserve indicator assists with managing the manually wound movement. The dial features rich guilloche texturing and classic Vacheron Constantin hands in gold, for a stunning yet unpretentious look. 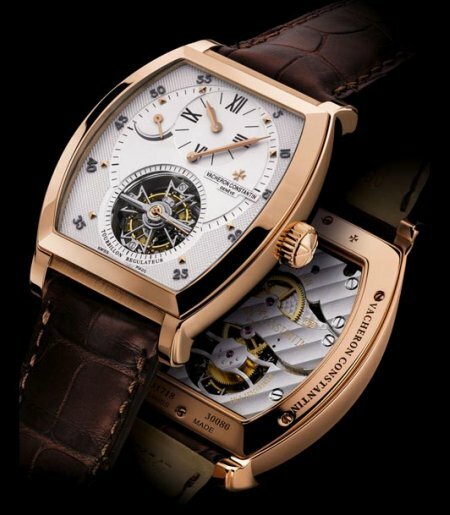 Seconds are counted by the tourbillon which makes a full revolution in its cage each sixty seconds. The case is superbly hand-finished and decorated with a design that improves upon the original Malte. Versions are available in platinum or 18k gold, with alligator straps. This Malte Tourbillon Regulator is the finest example of classic watch aesthetics that Swiss Vacheron Constantin watch manufacture produces. Vacheron Constantin Malte Tourbillon Regulator Watch Judged Year’s Best Tourbillon originally appeared on Luxist on Fri, 12 Dec 2008 17:02:00 EST. Please see our terms for use of feeds.